Dwight Howard slams two of his 23 against Brooklyn. The By The Numbers recap for the Lakers’ 95-90 win over the Brooklyn Nets at Staples Center on Tuesday night. The Lakers are now 6-5, and next play at Sacramento on Wednesday night. The winning percentage of the Nets after the Lakers victory over them on Tuesday. It marks the first time the Lakers have beaten a team over .500 this season. The amount of points the Lakers allowed on Tuesday night. They are now 4-1 when the opposition scores 90 points or less. Their only loss was the 84-82 defeat to San Antonio last Tuesday. The amount of points the Lakers starters scored on Tuesday, led by Kobe Bryant’s 25 on 15 shots. Other than Darius Morris, the other four starters scored at least 17 points. The percentage of shots the Nets missed on Tuesday…meaning of course they shot 41.5% from the floor, hitting 34 of 82 shots. Only one player who took more than three shots hit 50% of them…Brook Lopez at 11-18. The percentage of free throws the Lakers hit on Tuesday, going 19-37. Yes a lot of that was Dwight Howard who shot a miserable 7-19 (36.8%), with a bunch of them in the 4th quarter as Brooklyn began to purposely foul him. Despite that, the Lakers still hunkered down and won the game. The number of points the Nets scored in the second half. This marked the first time all season the Lakers have won a game they trailed at the half. Brooklyn led 57-56 at the break. The number of points the teams’ two benches scored. Neither was very effective…the Nets had 17 from the reserves, and the Lakers just 10. The number of assists the Lakers had on their 35 baskets. They only turned the ball over 11 times, and with that came a very solid assist/turnover ratio of 2.09. Ball movement wasn’t as crisp as it has been, but Brooklyn is a very good defensive team also. The number of rebounds Dwight Howard grabbed on Tuesday. He’s now pulled down 73 boards in his last five games (14.6 rpg), and has seven double-doubles on the season…including five in a row. 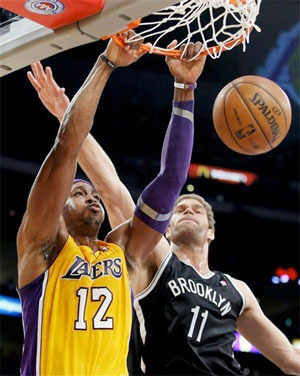 The number of field goals the Lakers made in the 4th quarter against the Nets…and yet they won the game! 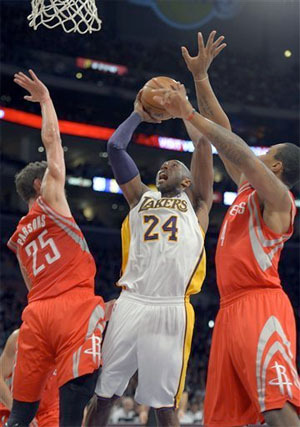 Metta World Peace hit a three, Dwight Howard had a dunk, and Kobe had a baseline runner in the final two minutes. Other than that, it was all free throws…and lots of missed ones too. But it didn’t matter, they got the win. See you after tomorrow’s game in Sactown. Kobe Bryant fights to get shot up against Phoenix. The By The Numbers recap for the Lakers’ 114-102 win over the Phoenix Suns at Staples Center on Friday night. The Lakers are now 4-5, and next play home to Houston on Sunday night. The number of times the Lakers have beaten the Phoenix Suns all-time in the regular season. The two teams have played each other 222 times counting Friday. The Lakers have a +.500 regular season winning percentage against every team in the NBA except for the Boston Celtics and amazingly…the Charlotte Bobcats. The amount of points the Lakers scored Friday, their most this season. And they did it while playing a much more up tempo offense which is the hallmark of a Mike D’Antoni-coached team. Kobe Bryant’s free throw percentage through the first nine games. After hitting 10-11 on Friday, he’s now made 56 of his first 61 to start the season. Oh by the way, he’s also shooting 53.1% from the field. The amount of points Metta World Peace has scored in his last three games, including 22 against Phoenix on Friday. He’s also made 11 of his last 26 three-pointers, as his shooting is definitely improving. Good to see. The number of rebounds the Lakers grabbed on Friday, as they continue to dominate their opponents in that category this year. They’re averaging over 47 rebounds a night, nearly 15 at the offensive end. They had 17 offensive boards Friday. Number of assists the Lakers had on Friday, which certainly is a big part of the reason they scored 114 points. Kobe and Darius Morris had 6 apiece to lead the team. The number of turnovers the Lakers had Friday, which was a season-low. Think about the fact that they were playing a more up tempo style, but actually turned the ball over less. That’s a good sign right there. The amount of foul shots Phoenix made on Friday. They actually only attempted 15, which isn’t surprising considering they don’t have a lot of guys that drive to the basket, and they do rely on the outside shot so much. But still interesting. Kobe by himself made 10. That’s all for tonight, see you Sunday. 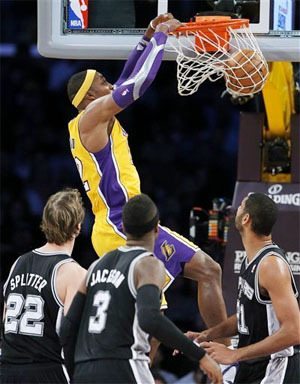 Dwight Howard dunks amongst three Spurs on Tuesday. The By The Numbers recap for the Lakers’ 84-82 loss to the San Antonio Spurs at Staples Center on Tuesday night. The Lakers are now 3-5, and next play home to Phoenix on Friday night. The Lakers regular season winning percentage against the Spurs after Tuesday night’s loss. They’re now 74-73 all-time against San Antonio, but 34-18 against them in the playoffs. The number of missed shots the two teams had combined Tuesday, in what was a very ugly offensive game. The Lakers shot just 41.9% from the field and the Spurs an even worse 38.9%. The Lakers free throw percentage as a team after eight games…not good. They were awful on Tuesday again, hitting just 14-22 (63.6%). Those things matter in close games. Kobe Bryant’s field goal percentage this season after eight games. He hit 12-19 shots on Tuesday against the Spurs for 28 points. He’s also hitting 92% of his foul shots and 44.1% from the three-point line. Basically he’s on fire. The age Metta World Peace turned today. He scored 12 points on his birthday, but missed a wide-open three near the end of the game that would have sealed the win for the Lakers. The amount of rebounds Dwight Howard has grabbed combined the last two games. He had 18 against Sacramento on Sunday and 15 more on Tuesday against San Antonio. The amount of points the Lakers bench scored Tuesday. Nobody shot a particularly horrible percentage, they just didn’t get up a lot of shots. Jordan Hill looked good again with eight points and six rebounds, and lots of great hustle. The number of turnovers the Spurs committed Tuesday. Want to know how to stay in a game you’re shooting under 40% in? Well here’s one way, don’t turn the ball over. Conversely the Lakers turned it over 17 more times Tuesday. Looking for a bounce-back on Friday against Phoenix, see you then.